Home › AIR GUNS AMMUNITION › PELLETS H & N › Air gun pellets H & N Crow Magnum Diabolo 4.5 mm. 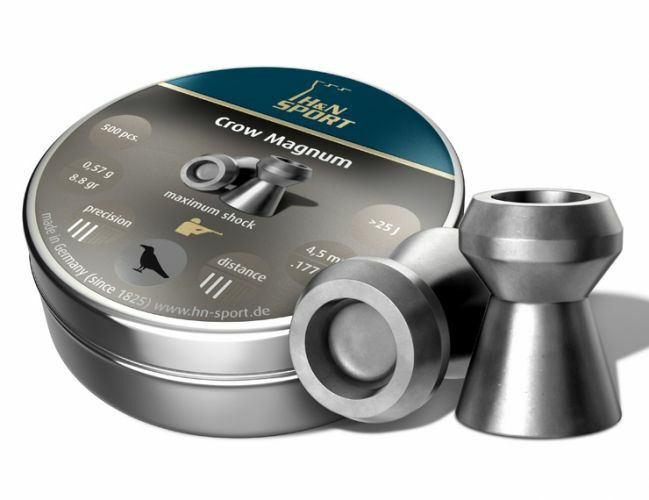 Air gun pellets H & N Crow Magnum Diabolo 4.5 mm. Pellets for air gun H & N Crow Magnum Diabolo 4.5 mm. Caliber 4,5 mm. Weight 0.57 g. Quantity 500 pieces in box. Medium-weight, hunting pellet with flat trajectory for medium ranges. Maximum shock effect and deformation of pellets. Smooth with large hollow point.